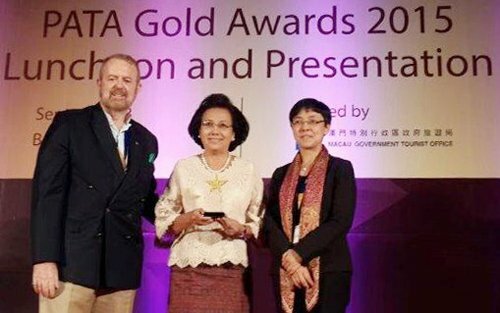 On behalf Siam Niramit, Mrs. Wallapa Phokawat, Assistant Managing Director attended the PATA Gold Awards 2015 presentation and received the PATA Grand Award for outstanding works and contribution on Heritage and Culture took place recently at the Bangalore International Exhibition Centre (BIEC) during the PATA Travel Mart 2015 in Bangalore, India. Siam Niramit, at the Lunch and Award Presentation held at Jacaranda and Gulmohar, Conference Center, India. “Siam Niramit aims not only to showcase Thailand rich cultural heritage to the world, but also to make Thai people take pride in their culture and inspire them to love and preserve it. “Khun Pannin Kitiparaporn, CEO Siam Niramit told about this tourist product.